System Overview. For a query image, our coarse-to-fine approach first finds the top matches in the dataset using GIST and Tiny Image descriptors, which is followed by an outlier removal procedure. 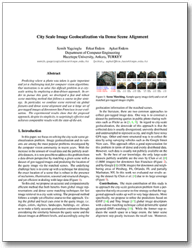 This initial set of images is then refined by densely aligning the retrieved images using DSP matching and accordingly removing the outliers this time by consider the alignment scores. Predicting where a photo was taken is quite important and yet a challenging task for computer vision algorithms. Our motivation is to solve this difficult problem in a city-scale setting by employing a data-driven approach. In order to pursue this goal, we developed a fast and robust scene matching method that follows a coarse-to-fine strategy. 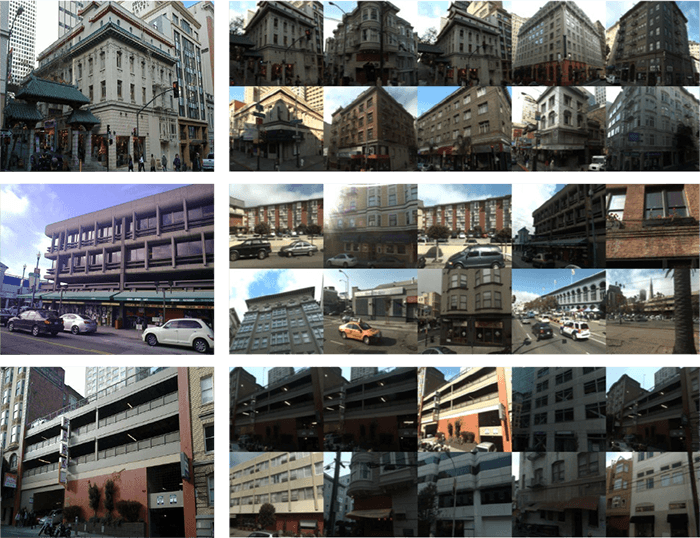 In particular, we combine scene retrieval via global features and dense scene alignment and use a large set of geo-tagged images of downtown San Francisco in our evaluation. The experimental results show that the proposed approach, despite its simplicity, is surprisingly effective and achieves comparable results with the state-of-the-art. Query images (left) and retrieved images from the dataset (right).